The constellation Ophiuchus is a richly adorned portion of the sky and has a number of beautiful globular clusters contained within its boundaries. 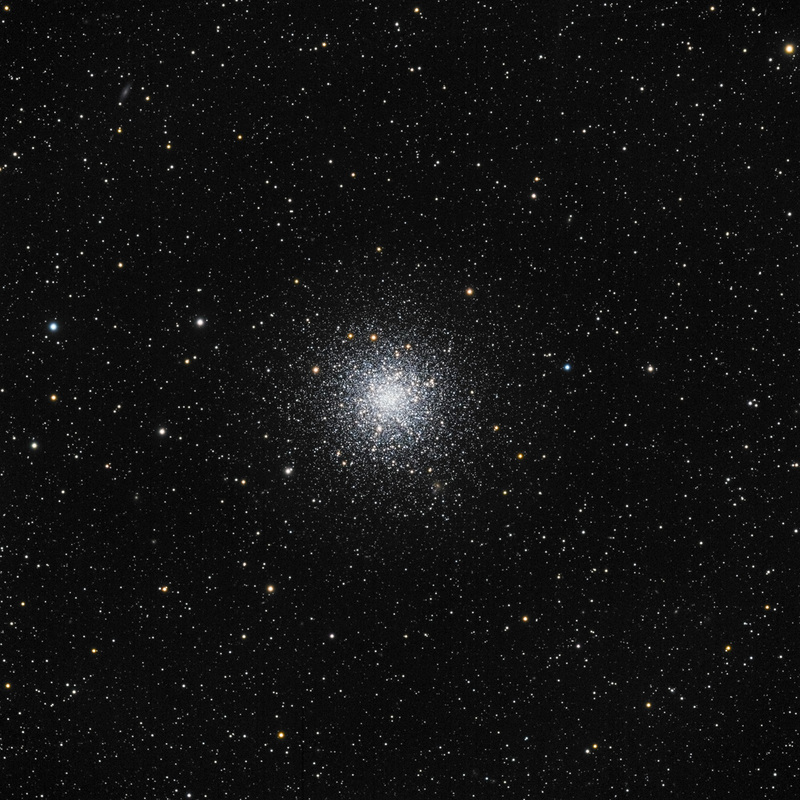 This globular cluster was discovered by Charles Messier on May 30, 1764, one day after his discovery of neighboring cluster M10. It lies about 16,000 light years from earth, spans about 75 light years in diameter, and has an approach velocity of 16 km/sec towards earth. At magnitude 6.7 it's just too faint for the naked eye but makes an interesting object in a small telescope. A 4-5 inch telescope will begin to resolve some of the brighter stars around the core. Located at a 5 o’clock position and 7 arc-min from the center of M12 are two small galaxies visible in close proximity in the higher resolution image, the northerly most one being 2MASX J16470200-0202314. With a recessional speed of 11917 km/sec and redshift of 0.061662 (ref: Simbad), this galaxy is between 850 to 900 million light-years away assuming a Hubble constant of 70 km/sec/Mpc. In the upper right corner of the image is galaxy PGC 59025, a 15th magnitude object over 70 million light-years from Earth. Upon close examination countless other distant galaxies can be found sprinkled amongst the starry landscape. This image is the result of a collaborative effort between Howard Hedlund of Astro-Physics, Inc. and Dave Jurasevich.